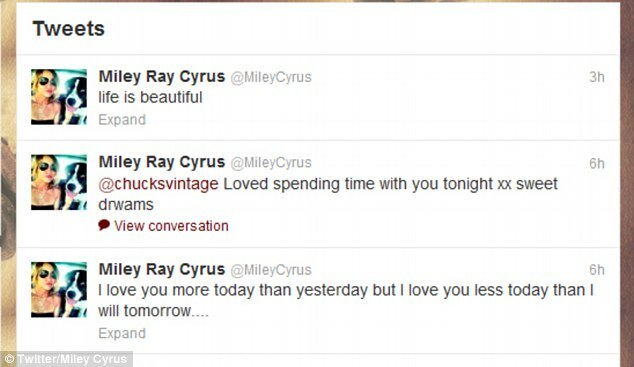 'Life is beautiful': Miley Cyrus, 19, has announced that she is engaged to boyfriend Liam Hemsworth. The Hunger Games actor proposed to the former Disney princess on May 31 with a 3.5-carat diamond ring from jeweller Neil Lane. People.com is reporting that actress-singer Miley Cyrus and her longtime boyfriend, actor Liam Hemsworth, are offficially engaged. The magazine’s website revealed the news this morning. Cyrus, 19 and Hemsworth, 22, met on the set of the film “The Last Song” in 2009 and have been a couple ever since. Hemsworth most recently co-starred in the box office megahit “The Hunger Games,” and will be featured more prominently in the film’s sequel due out next year. Cyrus, the daughter of singer Billy Ray Cyrus, is reportedly working on a new album. According to the report, Hemsworth popped the question over the weekend in Los Angeles, presenting Cyrus with a 3.5-carat diamont ring set in gold. “I’m so happy to be engaged and look forward to a life of happiness with Liam,” Cyrus tells the magazine. The new issue of People, with exclusive photos of the couple, hits newsstands Friday.